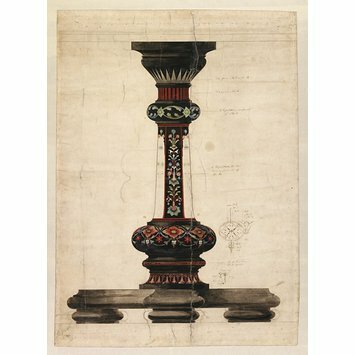 Birley, based in Derbyshire, specialised in inlaid marble objects. 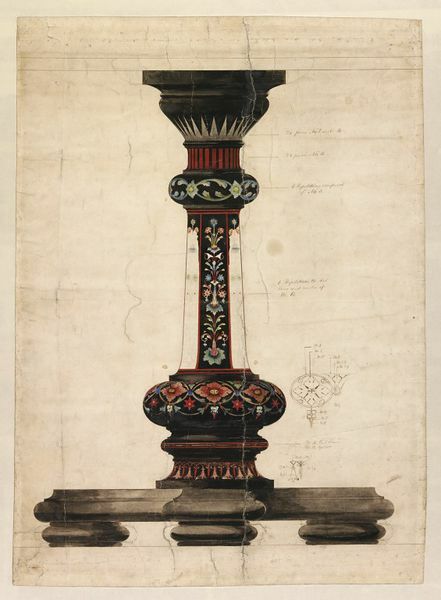 These imitated the Italian mosaic inlaying technique known as pietra dura, or 'hardstone'. Artisans working for the powerful Medici family developed the art of pietra dura in Florence in the 16th century. The technique is similar to marquetry on furniture. This achieves its decorative effect by arranging sections of differently coloured veneers in the manner of a jigsaw. In this technique, thin polished slices of hard or semi-precious stone are used. They are cut to form images, for example of flowers or fruit. Often the colours of the stones are used to produce highly naturalistic detail. This piece is one of the most elaborate pieces known. Donated by Louise Birley, descendant of the designer. Design, for pietra dura table, by Samuel Birley, Derbyshire, ca. 1862.